Located in Raeford, NC we’ve been serving the communities of Raeford and Hoke County since 1947. 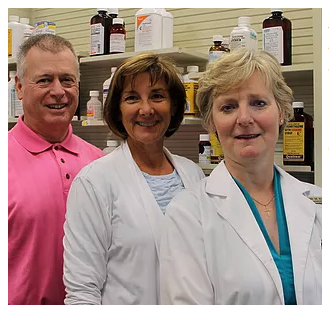 Our pharmacy staff has a combined 100 plus years of experience and our friendly staff will treat you like family. At our Pharmacy, we believe that being a local independent pharmacy means providing healthcare to our patients that is customized to meet their needs. Visit us today and let us take care of you. We have three pharmacists on staff to serve your needs. Tom Howell, Rph graduated from the UNC School of Phamary in 1976. Kim Howell, Rph graduated from the UNC School of Pharmacy in 1981. Sara Ellis, Rph graduated from the UNC School of Pharmacy in 1981.